Although the two are often confused for one another, there are many defining characteristics that differentiate between alligators and crocodiles. Alligators and crocodiles share a similar physical appearance. More often than not crocodiles and alligators are confused with one another. Despite both of them being reptiles and having an uncanny resemblance, there are a few significant physical characteristics that differentiate the two reptiles. One of the easiest ways to tell the difference between the crocodiles and alligators is by looking at the shape of their snout. Crocodiles tend to have a longer V-shaped snout whereas alligators have a broader U-shaped snout. An alligator's broad snout is built for strength to help them crush their hard-shelled prey such as turtles. Crocodile snouts are less strong because they mostly feed on fish and mammals. The upper and lower jaws of crocodiles are almost the same in width such that its teeth are exposed in an interlocking pattern even when the mouth is shut. On the other hand, an alligator has a wider jaw such that when its mouth is shut, teeth in the lower jaw fit into the sockets without being exposed. However, teeth on the upper jaw are exposed on the lower jaw line. 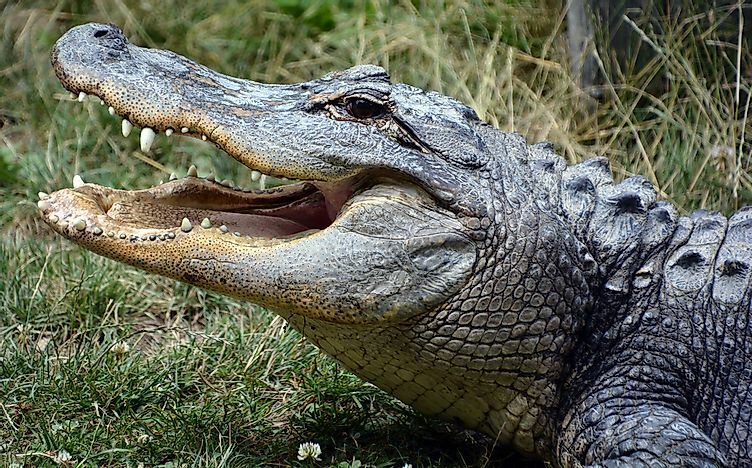 Alligators have more rounded teeth whereas crocodiles have pointed teeth. Adult alligators tend to have a dark grayish black color whereas adult crocodiles usually have a brown or tan color. The color of their skin is usually determined by the environments in which they live. Alligators that live in darker waters such as swamps have a darker color whereas crocodiles that live in lighter colored water environments have a lighter skin tone which tends to be the suitable for camouflage, especially when waiting for prey. One of the most interesting differences between crocodiles and alligators is salt glands. Crocodiles tend to have functioning salt glands on their tongues which are only nearly visible while the creatures are basking in the sun on land with their mouths wide open. The crocodile’s salt glands are modified salivary glands that allow the crocodile to excrete huge amounts of salt to its environment. The latter is what makes crocodiles more adapted to salty water than alligators and suggests that crocodiles could survive as marine life and that is how their populations got to spread worldwide. Full grown crocodiles tend to be longer than alligators. Full grown alligators weigh between 800-1000 pounds and can live to between 30-50 years whereas crocodiles which are a bit larger weigh between 1,000-2,000 pounds and have a lifespan of between 70-100 years. Since alligators are unable to tolerate salt in the same way crocodiles do, they prefer fresh water habitats whereas crocodiles thrive in the saline environment. Compared to the worldwide spread of crocodiles, alligators are native to the US and China. In the US alligators are distributed in the Southeast of the US while in China they are limited to Yangtze River valley. Crocodiles usually reside in wetlands rivers, lakes, and saltwater regions and they prefer tropical climates since they are cold-blooded and cannot generate heat on their own. According to a recent study, 70% of female alligators can reproduce with the same male counterpart every mating season. However, this behavior is not the same with female crocodiles since studies on crocodile mating deduced that crocodile young ones could contain genes from different males. What Are The Differences Between A Caiman And An Alligator?